Das Original Export schaut auf eine lange Tradition zurück. Als erstes Export in Süddeutschland wurde es bereits 1886 von dem innovativen Braumeister Josef Munz erstmalig bei Fürstenberg gebraut. Als „Danubia-Exportbier“ fand es weltweit seine Liebhaber. Der prominenteste „Fan“ Bismarck wählte es zu seinem „Haustrunk“. Goldgelb in der Farbe, vollmundig malzaromatisch im Geschmack. Bis heute brauen wir es mit viel Hingabe in Anlehnung an die Originalrezeptur von einst. Wir verwenden dazu spezielle Hefen aus eigener Reinzucht und eine besondere Mischung von erlesenen Malzen. Sein Geheimnis: Die richtige Lagerzeit bis zur perfekten Reife. Eine traditionelle Spezialität für alle, die das reife Aroma schätzen. Genuss aus Tradition - seit Generationen begehrt! 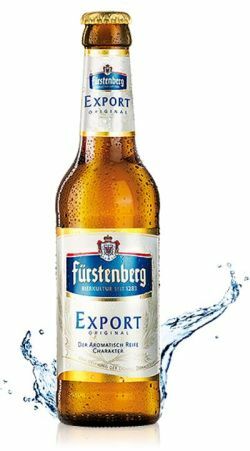 UPDATED: FEB 22, 2019 Bottle as Fürstenberg Premium Lager. Nose: clean malts, spicy hop of good quality. Similar taste. light bitterness. Good lager. Tap at the brewery. Brilliantly clear gold with a fluffy head. Slightly lemony, malty nose, honey. Sweet malt flavor with lemon / orange and honey. Finishes relatively clean, but a bit too sweet overall. Geel bier met schuim wat snel wegzakt. Smaak is licht bitter hoppig en waterig met een heel licht vreemde bijsmaak die niet te plaatsen is. Valt tegen. A decent drop but not up there with the best German lagers for me. The worst thing about it is the smell: the normal clean lager smell is overlaid by a note of Airfix glue and rotten mushrooms. The taste starts well, with some nice bready malts but hollows out to a wateriness at the core. I can't taste much bitterness. I can enjoy a non-bitter beer, but the way this one peters out to nothing on the aftertaste is a bit anticlimactic. But I'm not saying this is a bad lager--I can think of a hundred worse--it's a decent lager, but it pales beside pils such as Jever and pretty much any Bavarian helles lager. Pale gold, standard larger look, head starts off proud and large and quickly disappears. beer in the glass is very lively, the small head remains. Nose is distinctly hoppy not much else going on. Beer is weak bodied with slight tingly bubbles on the tongue. Taste is larger same as any other style crisp with a very hoppy aftertaste. Lack of metallic finish makes it a very drinkable lager. Nothing spectacular but does what it says on the tin. UPDATED: AUG 2, 2017 Botella 33 cl del c Inglés Oviedo tomada en Oviedo junio 2002. (r140). Lote L2204 13:15 hasta 07..2003 grabado en botella. Botella blanca etiqueta plástico. Cereales y levaduras, sin muchos recuerdos agradables. Corriente. Aroma of corn. Medium fizz, corn and grass. Very bitter at end. Completely dependable macro German. Couleur jaune dorée, forte mousse blanche. Nez malté céréales. Gout malté avec bonne amertume houblonnée. Bonne pétillance. Mais il y a des meileures dans le genre. Cerveza obtenida en supermercados Jumbo, Santiago de Chile. A mi parecer de un aroma levemente floral, de apariencia palida, de sabor medianamente dulce insistiendo en ese sabor a "polen". Muy ligera, medianamente carbonatada. A mi parecer dentro de la categoría de cervezas "en masa" la recomendaría como una opción distinta debido al sabor.